With this Strawberry Shortcake cake I used 2 9" round cakes and a 11"x15" cake pan. I used 1/2 of the 11"x15" and made the lond part of the 6 and used the 9" to make the round part. I took the other half of the 11"x15" and cut circles to make the house. I used red buttercream to ice the house and green buttercream to ice the bottom. I then placed the yellow dots for the house and flowers and windows, used the white to do the flowers and the stepping stones and patio(which I flattened with my finger)and also the trim and door. I then used red to make the strawberries around the edges and green to place leaves atop the house and on the flowers and make the trim. It took about an hour after dirty icing to actually decorate the whole cake. I love this cake so much, WISH ME LUCK everyone I am going to try and make this for my daughters birthday tomorrow. I hope it turns out well and I hope she loves it! Thanks to those who commented. This was a huge hit for Wakeenas birthday also. Everyone wanted to eat the house..LOL..
5 year old Analiese loved it !!! 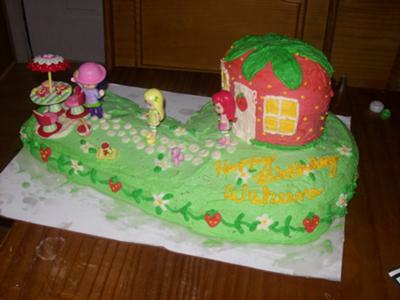 Thank You for all the great cakes; this one was a hit ---- I used an 11 x 15 base; did not cut and stacked the house out of 2 8" rounds --- east to ice and used the Strawberry Shortcake and friends with a table and chairs. It's really cute! I'm gonna try and copy it for my daughter's 3rd birthday party. Great Job!! Oh, I love that! You did an awesome job!!!!!! Join in and write your own page! It's easy to do. How? Simply click here to return to Strawberry Shortcake Cake.